Arrow Slit, Old City Wall is the image for October in my new calendar, The Jewish Eye 5779/2019 Calendar of Art. 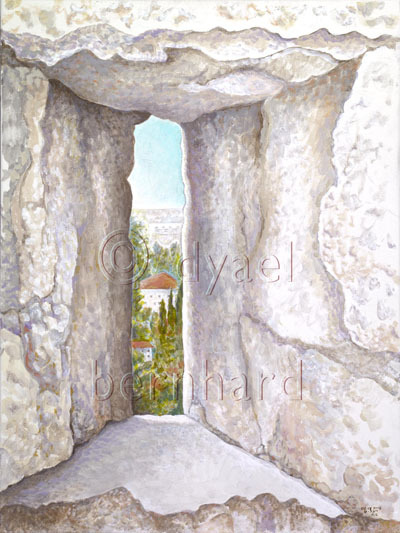 This painting is my latest endeavor to articulate Jerusalem stone – a remarkable limestone which hardens over time, withstanding the passage of millennia. Though chipped and weathered, the entire wall that contains this narrow slit has stood for twice as long as the United States has existed. Many of my landscape paintings present a relationship between near and far. Typically, something large in the foreground – such as a tree – forms a close-up frame for something small in the distance. The relationship between the two creates visual tension. Here, the foreground object – the solid wall – forms an actual frame around the tiny sliver of neighborhood that is visible in the distance through the opening. Painting Jerusalem stone is an exercise in tonal subtlety. I approach each block as an individual, as if I were painting a portrait. In this case, I needed them to fit together and form the receding geometry of the window. Creating this structure while also articulating the aged and irregular surface of the stones was challenging. Would you be willing to write a review on Amazon? That would be most helpful!